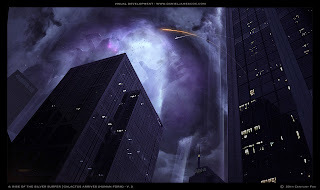 Check out Fantastic 4: Rise of the Silver Surfer Galactus concept art by Daniel James Cox! 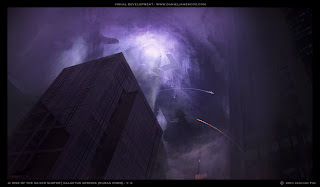 I ran into some amazing concept art a while back that pointed to a very different interpretation of Galactus "Devourer of Worlds" by Daniel J. Cox. In Fantastic 4: Rise of the Silver Surfer Galactus is a gigantic cloud, but Daniel was kind enough to dig up some renderings of Galactus that show his human form from the comics. Cox is a professional concept and storyboard artist who's worked on big budget movies like The Wolverine (2013) The Great Gatsby (2013) and Knowing (2009). 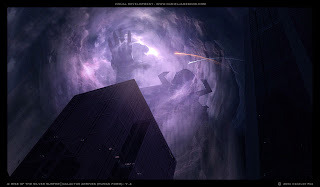 Galactus first appeared in Fantastic Four #48–50 (March–May 1966) - which fans call "The Galactus Trilogy" - and he was designed by Stan Lee and Jack Kirby. "Galactus was simply another in a long line of super-villains whom we loved creating," Lee said, "Having dreamed up [many] powerful baddies ... we felt the only way to top ourselves was to come up with an evil-doer who had almost godlike powers. Therefore, the natural choice was sort of demi-god, but now what would we do with him. We didn't want to use the tired old cliche about him wanting to conquer the world. ... That was when inspiration struck. Why not have him not be a really evil person? After all, a demi-god would be beyond mere good and evil. ... [What] he'd require is the life force and energy from living planets!" In the film, all we see is a massive cloud, but it turns out there's a guy in there. The concept artists were told to create something intentionally vague. Vfx supervisor Eric Saindon told Animation World Network, "They wanted something that was a bit discrete and wasn't a big focus for the movie." Fantastic Four 2 director Tim Story said they were planning to show him in future Fantastic Four films. 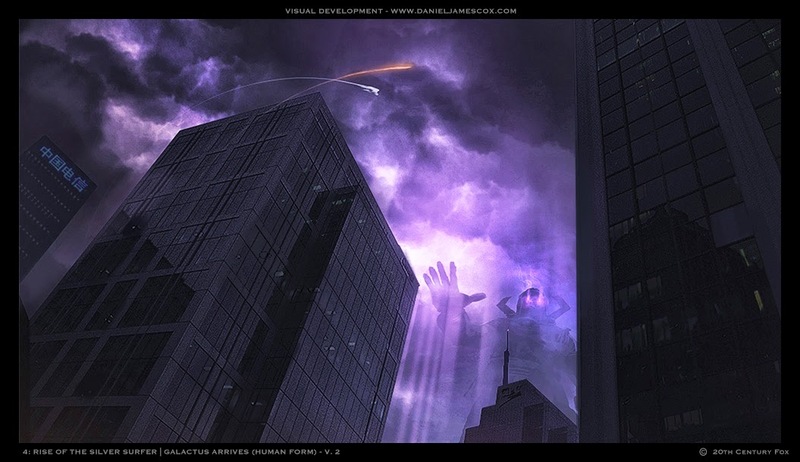 Back in 2007, writer J. Michael Straczynski told IGN the Silver Surfer spin-off movie he was writing was going to show Galactus. "You don't want to sort of blow out something that big and massive for one quick shot in the first movie." Straczynski said, "Where you're showing the origin of the Surfer, that's where you do it; that's where you blow it out." We got glimpses of him thanks to Saindon. "We do the helmet in there some, you see it below the surface on a few shots. It took us a lot of convincing to get that in there." The Fantastic Four films are being rebooted in 2015, so we can kiss those sequel plans goodbye. Who knows if he'll show up in the new films, but here's what he looked like in 2007. For comparison, here's what he looked like in the comics. Click on the links if you want to see more of Daniel James Cox concept art and Fantastic 4: Rise of the Silver Surfer on my blog. What do you think of the concept art? If you've seen Fantastic 4: Rise of the Silver Surfer what did you think? 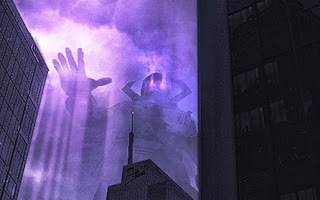 Would you have preferred Galactus in another form? Catch a wave of "terrific adventure" and "non-stop action" (CBS-TV) in this fun and fantastically entertaining smash-hit! "Invisible Woman: Sue Storm and "Mr. Fantastic" Dr. Reed Richards are about to be married when a mysterious alien... the Silver Surfer... crashes the proceedings and heralds Earth's impending destruction. With time running out, the Fantastic Four reluctantly teams up with the nefarious Dr. Doom in a thrilling effort to save our planet! I think that would've worked! 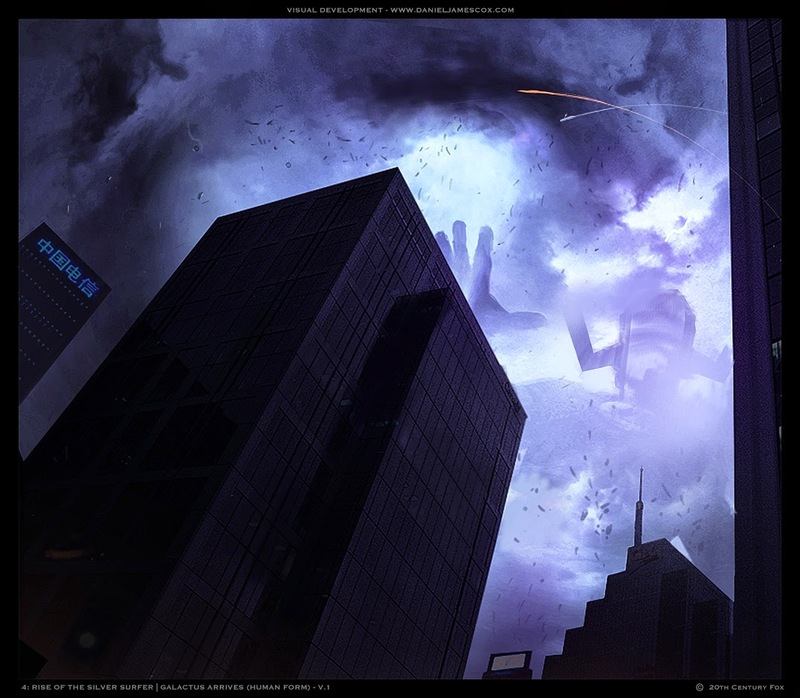 A truly terrifying Galactus is possible and well within reach Josh. Let’s hope it happens.